EmuLa v2.0 released: lot of changes and improvements! May 15, 2017 May 15, 2017 allanonLeave a Comment on EmuLa v2.0 released: lot of changes and improvements! EmuLa v2.0 is finally available for Linux ARM-generic (pi), Linux ARM-Odroid and AROS and Windows. Hi followers, EmuLa v2.0 is here! Many things are changed within EmuLa, some was planned, some was suggested by you, so, first of all, I’d like to thanks all people using this software with a special thanks to the ones that have helped reporting bugs and suggestions! FIX : Added a couple of missing NES ROMS. FIX : Minor adjustments in the GUI colors, sometimes a GUI style was applied on inappropriate GUI elements. NEW : Added a button in the About box for unregistered users to allow them to obtain informations about the premium version and/or to register their license. 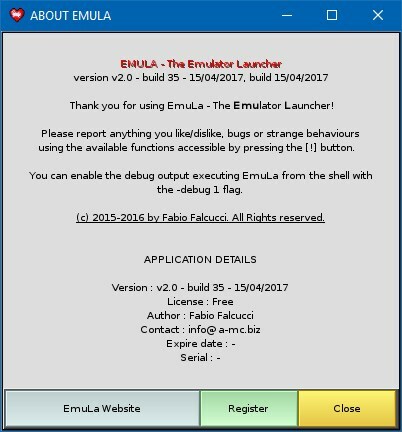 NEW : All games basic informations are now available with EmuLa package to reduce downloads, however using the ReFetch function it is possible to refresh these informations. 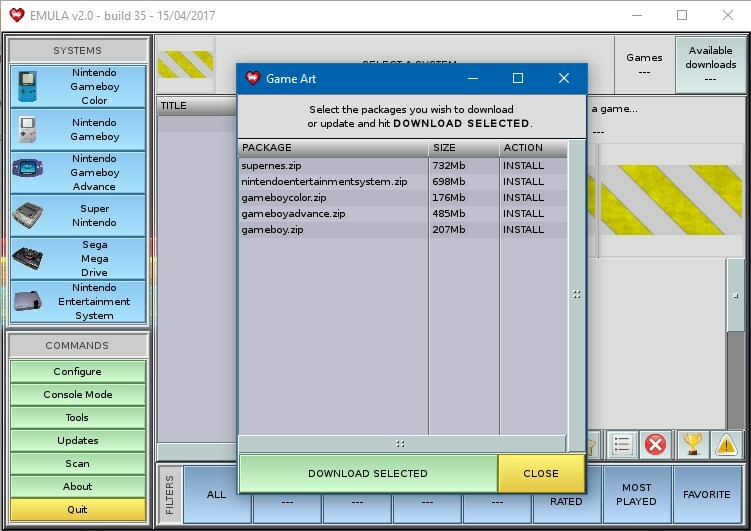 NEW : Possibility to download game-art packs, also an update mode is available from the same interface. This feature is accessible from the TOOL button. (Premium feature). FIX : Added missing translation for SuperNES. NEW : Increased readibility on the current rom info box. NEW : The current rom info box is no more of fixed size, its size is adjusted when its contents changes. NEW : Added in the scan progress window the files count to analyze/analyzed. NEW : EmuLa now stores game art using a better model to avoid duplicates, for example with hacked roms, this new method saves a lot of storage space. If you are updating from the previous EmuLa version you can convert the old game art using the Refetch function (accessible from the TOOL button) or clearing the old game art and download it again using art-packs or the refetch / scan functions. Anyway it’s not mandatory, EmuLa still recognizes the previous format. NEW : ROM informations are now cached, this make the scan much faster if you have several version of the same rom. FIX : Sometimes, closing Emula in console mode, an error was raised saving the current preferences. NEW : In console mode, rom names and descriptions, if longer than the available screen space, will scroll to the left. NEW : In console mode page indicators are no more of fixed size, they are resized automatically if they does not fit into the current screen width. 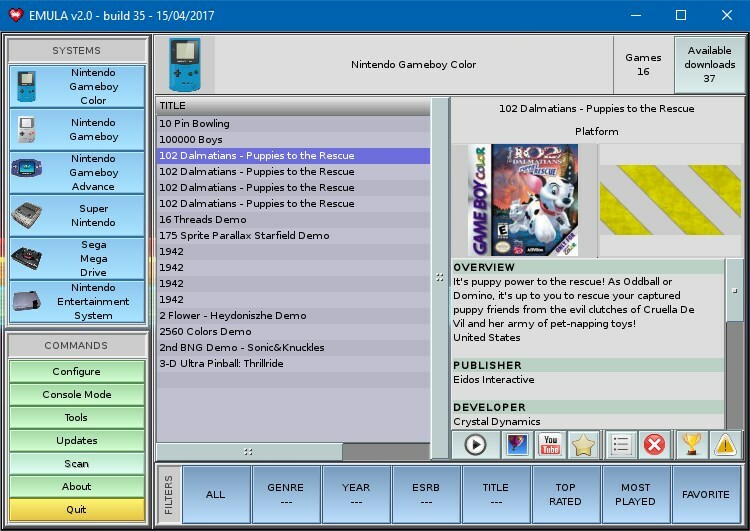 NEW : When a game is started now EmuLa will show an image with the current controls assignment for the involved emulator. 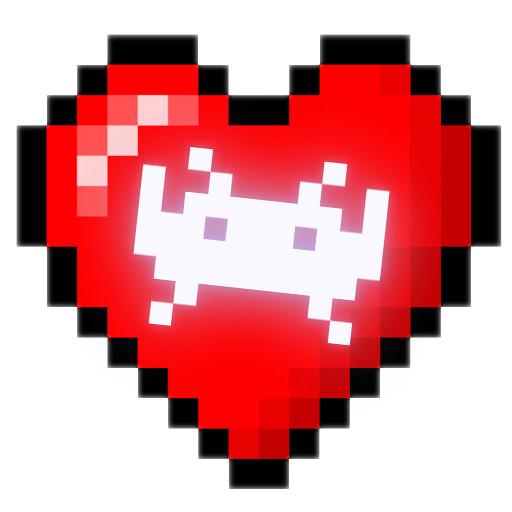 The image will be still visible in EmuLa background even while running your games so that you can peek at it to check controls on the fly while playing. For now this feature cover the keyboard mapping only. On the IndieGo! some keyboard controls are not defined at all, me and Pascal are working to build at least a default keyboard mapping. FIX : From now on the update process will not overwrite anymore the icon file on Amiga-like systems to avoid to reset the icon position. NEW : Now Emula will check host screen resolution before opening its main window and if it is bigger than the screen size Emula will try to reduce its size to fit to the screen. Low screen resolution should be supported now . There could be readibility problems for very small screens. Emula is now able to show the currently assigned keybord controls! I’ve tested this version on VMWare, the update process as well as the art-packs download was a bit long during the file copy/update phase, please be patient even if EmuLa seems to hang, at the end of the process you will be informed with a message window. WHAT TO DO TO UPDATE? Open you current build and hit the UPDATE button, a new version will be downloaded and installed, be patient . WHAT TO DO TO INSTALL EMULA FROM SCRATCH? If you do not have a license file support me buying one! Open Emula folder and run the executable named “Emula”. Premium users can now download art-packs in one go! The rom’s information box is now more polished. When downloaded art packages are uncompressed there is no status window that shows the progress, please be patient, at the end of the process Emula will show you a message saying that the operation has been completed. To show the key mapping Emula needs to parse the mednafen configuration file that is HUGE! This could lead to some seconds of delay before your game is started, if you cannot live with it let me know and I will make this feature switchable in the preferences. Due to the latest changes in console-mode the rom art is no more visible, it has been already fixed on my internal builds, it will be made public very soon. The next big thing will be to add support for Amiga systems in all its flavours. A very handy, but still top secret feature! I have a list of cool features growing day by day but I will add them only when I’m sure that there are no bugs in the current version. Feedback : I need feedback, please report your thoughts, if you find things difficult, if Emula crashes, if you like Emula or if you dislike it and why. I will listen to your voices. Spread the world : If you like Emula please talk with your friends about it, let your friends try the free version and If they are reluctant to subscribe and are interested to try the full version I can provide a 2 week subscription license to try it out. Support on Patreon : Even a single dollar is important, and you will be my hero! Feel free to ask me anything about anything related to this project! Next Post Next post: EmuLa Tutorials : it’s time to show how easy is EmuLa!